We received our first delivery of coins on the 11th November. On 2nd March, 2015, The Royal Mint will unveil a new effigy of the Queen. Coins made from this date onwards, will feature the fifth portrait on the obverse. This means there will be two versions of the 2015 Britannia. For the new fifth portrait, click here. 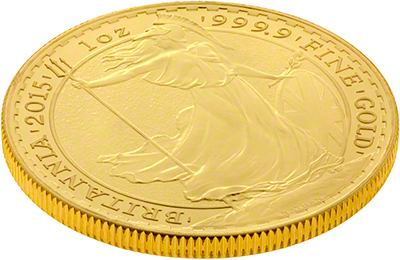 The 2015 gold Britannia features the standing Britannia design on the reverse, as used in recent years. 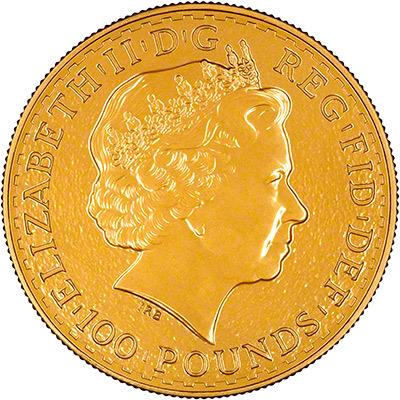 The obverse features Ian Rank-Broadley's portrait of the Queen. This will be the last time the portrait appears on a Britannia, as it will be replaced with the fifth portrait designed by Royal Mint engraver Jody Clark. The field on both sides of the coin has a dimpled effect, giving it a matte finish. We prefer this as it doesn't show any production marks which we've come to expect in previous years.